David’s Wednesday afternoon so I could learn Alex’s daily routine before David headed to DC to catch up with Mari at a conference. We picked Alex up at his afterschool program “Kid’s Corner” and took him to his swimming lesson, afterwards had dinner at a Mexican restaurant that has been one of David’s favorites for over 15 years. Returning home I jotted notes on the evening and morning routines (aren’t we all creatures of habit loving routine?) and was ready to take over. In my note to neighbors that I was going to be gone again I mentioned that the thought came to me to spend Thursday in Lexington, Massachusetts (I experienced the American Revolution in Concord a few years ago so I was overdue for Lexington) and on the drive here I said, “hey, Ray, why not go to Lowell on Friday and explore the Lowell National Historical Park with the industrial and textile museums. My daytime plans were set while Alex was in school. Thursday, September 15th we walked Alex to school, David headed to the airport, and I read awhile before I skipped over to Lexington to the National Heritage Museum and its exhibit, “Sowing the Seeds of Liberty: Lexington and the American Revolution.” What I did not know (and is not mentioned in the advertising literature) is that the museum was founded by and is supported by the 32 Degree Scottish Rite Freemasons in the Northern Masonic Jurisdiction. The facility is located on a gorgeous property, exquisite buildings, and obviously well endowed. The more I read about the French and Indian Wars, and the beginnings of the American Revolution the more solidified the events become in my mind, and this fine permanent exhibit helped with solidifying my understanding. I spent almost two hours enjoying the varied exhibits (many of which utilize the extensive Masonic collections the museum holds) ranging from costumes and Masonic regalia, and a “curator’s choice” featuring many varied items but well arranged presenting cultural reflections of the times. An easy drive, less than two hours from Walpole, may I recommend that you add this museum to your list. I then travelled less than a mile downtown to get a sandwich, and found town overrun with kids. While in a deli ordering a wrap I asked a young patron, “why so many kids in town?” He told me it was a half day of school. 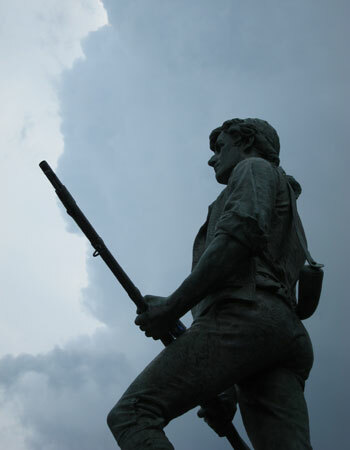 Wrap in hand I exited to walk to the Battle Green to eat only to be met by pouring rain. Hey, I’m easy. I waited for a stool, ate my wrap, and scooted between rain-drops to the car to get my umbrella, and then back to explore the Historic Train Depot where I read about the history of Lexington as it developed from a farm community to a bedroom suburb with the help of the railroad whose roadbed is now the Bike Path/Rail Trail – The Minuteman Bikeway – (again worth the trip). Next on my list for the day (and now on yours) was the three historic houses owned by The Lexington Historical Society: The societies’ tour, FIRST SHOT: THE LEXINGTON REVOLUTIONARY EXPERIENCE includes: The Buckman Tavern on the common where the militia gathered; the Hancock-Clarke House which was Paul Revere’s destination to warn John Hancock and Samuel Adams of the impending danger; and the Munroe Tavern that the British used briefly as a field hospital on their retreat to Boston, and where Washington had dinner in 1789 (I did not sit in the chair he sat in while eating, but stood inches from it!). The tour of the three buildings is very well done, with well trained docents providing a perfect insight to the events on that fateful day. You must just experience it. So many “fast facts” and by seeing where the events happened it becomes real and understandable. And it was a full day when I finished up shortly before 5 with time to get to “Kids Corner” to pick up Alex at 5:15 (I was a few minutes early). 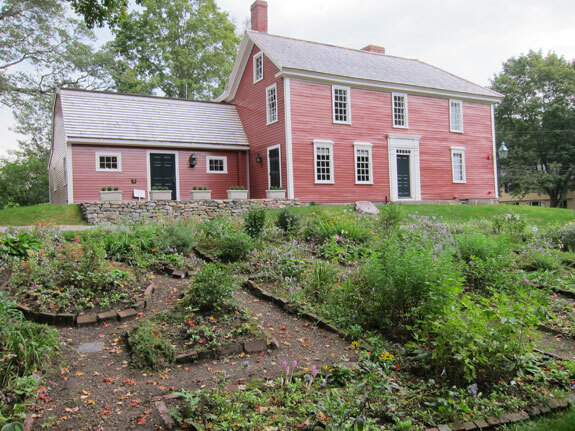 Munroe Tavern showing 1830 era Flower Garden - I still am struggling with the design of a Colonial Kitchen garden off my porch. So often I learn fascinating facts such as the derivation of words, terms and customs only to lose them again, but I remembered three such items at the Buckman Tavern and quickly wrote down hints to remember to share them with you. Prior to a formal postal service letters would be carried by most anyone from one tavern to another to be retrieved. 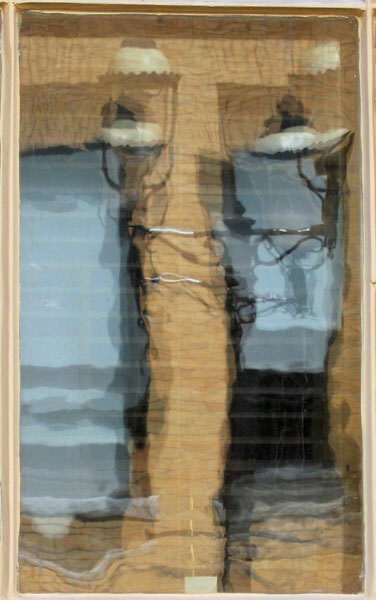 A letter coming or going was often attached to the corner post on a bar “cage” in the taproom – thus a “letter was posted.” I saw some Plexiglas covering something on the old wooden boards that had been exposed during restoration, and asked what was being protected. The docent pointed to some faint chalk marks which she explained were notes of bar tabs, and then proceeded to explain how important it was to record properly whether the customer received a pint or quart, thus the expression, “mind your p’s and q’s!” And then she proceeded to point out the parts of a rifle on the wall indicating the lock (for the flint), stock and the barrel – the whole being “lock, stock and barrel.” Such fun. Please don’t think I am always telling you my experiences are great no matter what, fortunately they have been, but believe me, if I “bomb” on something I will tell you what I thought, and it will be just my opinion. 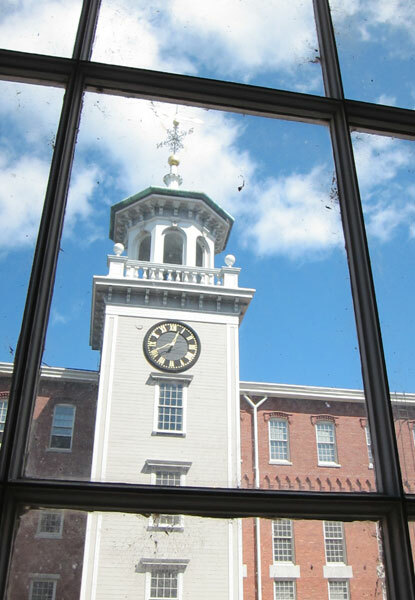 Having said that, Friday in Lowell, MA, and today in Newport, RI were fabulous. Friday morning getting Alex off to school went just like clockwork and we arrived as the bell was ringing having gotten everything done to have him ready to go for the day. David called me while I was walking back to his house – somehow I thought he would and I had my TracFone with me, and now I know how to answer it. When I got into the house Mari called to check too, and I reaffirmed all went very well. Shortly I hopped in my car and headed north for Lowell a tad over a half hour away, and an easy drive. 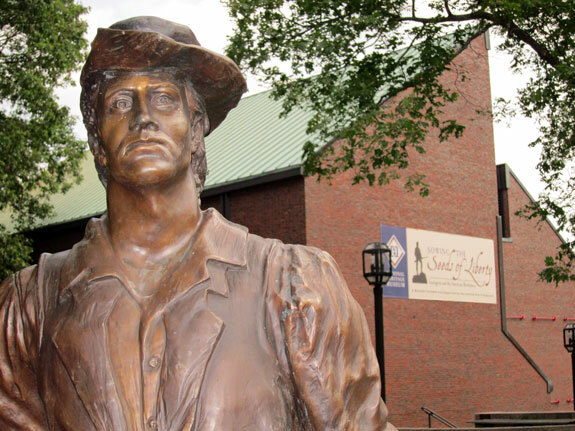 Early nineteenth-century Lowell was internationally known as a model city and initiated a successful beginning for the American Industrial Revolution. Sited at the intersection of the Merrimack and Concord Rivers, the drop provided powerful waterpower for the expanding textile mills, and soon canals were dug to increase the flow to the water wheels and turbines to supply more and more mills. In this early construction space was set aside for parks and walks along the natural and man-made waterways, and many exist to this day. As you know I am not a city person, but just as I feel about Istanbul and Vancouver (and always London) I am anxious to return. Lowell in the 21st century, I feel, is a model now for successful urban renewal. The textile mills came on hard times in the late 1950s and 1960s, and moved or closed forever. The city was a disaster, deserted mills and housing everywhere, but as I toured the museums and strolled around (for 5 hours) I was impressed by the neat and tidy look and the well preserved and restored 19th and early 20th century architecture. Even the few vacant storefronts needed a double look to see that they were in fact vacant. At the National Park Visitor Center I viewed the film on the development of Lowell, and then walked over to the exhibit at the Boott Cotton Mills Museum (also part of the National Park Service). This exhibit in the original mill showed the various operations in making textile cloth with running equipment on the first floor and museum exhibits on the second. There was an additional film there on the Industrial Revolution in the US. Now here comes some honesty – I am not “into textile mills.” Having specialized since 1980 in business and financial history books I cannot get enough education on the development of industries, but the technicalities of textile manufacture I can pass through quickly. Walking through the main city shopping area I chose to eat lunch at La Boniche on Merrimack Street and had the Grilled Pork with Orange-Hazelnut Butter over roasted zucchini and roasted potatoes. It was a great choice. I then headed to the Mill Girls and Immigrants Exhibit housed in one of the remaining company owned boarding houses for the mill workers. Originally in the 1830s and 1840s young New England farm girls were recruited to work in the mills, but starting in the 1840s with the Irish Famine immigrants began arriving followed by one nationality after another with each settling in separate areas in the city giving rise to the ethnic neighborhoods. 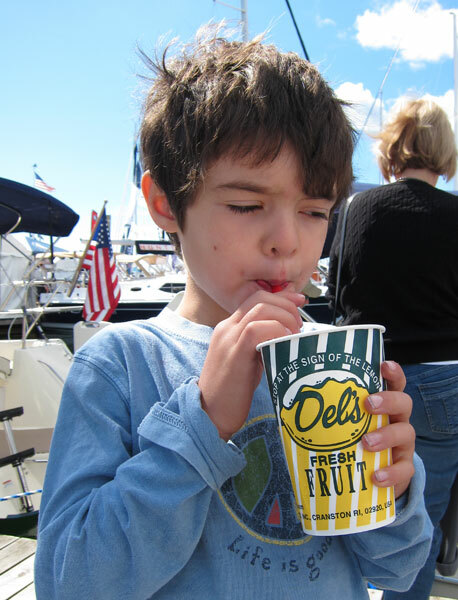 Alex with his Del's Lemonade - a Rhode Island tradition. This could have been David 35 years ago when the Del's truck would pass our house, bell clanging to summon the kids. (actually on the other side of the bay) in the early 1970s while with Operation Deep Freeze, and I later ran the Navy Finance Office in Newport. My Navy experience however goes all the way back to 1964 on a reserve cruise on the USS Sullivans DD-537 when I went to Provincetown, PEI, Canada to represent the US during the 100th Anniversary of the Confederation of Canada, and my first midshipman cruise left Newport following my Freshman year in college. It was a three hour round trip and we spent five hours at the show and walking in Newport. David could not believe we were gone so long, I told him that actually an eight hour day is a short travelling day for me. PS – I love old diners, and found two in downtown Lowell, here is one. 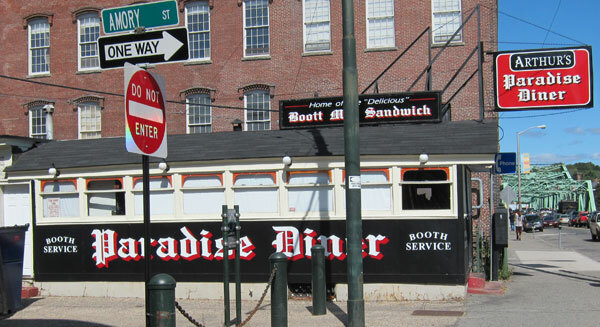 Paradise Diner - Lowell, Mass - one of two diners I passed - "oh, nostalgia!" This entry was posted in Day (or maybe two) Trips and tagged American Revolution, Lexington, Lowell, Massachusetts, Newport Boat Show. Bookmark the permalink. Have an enjoyable day today Ray. Boston looks so beautiful and I have always wanted to visit there. It was the next convention city when Hilary retired and I was unhappy to miss it. BTW, I am going with a girlfriend the first week of September to New York City. Never been there either. She has a free week’s stay at Candlewood Suites. Is it a good one? Now Marian, do not get mugged. -:) Old diners should be great. Somehow, I think they would have the best foods??? ?